The Dodgers dropped a game to the Giants, 5-4, in extra innings with Buster Posey walking it off against Kenley Jansen. This comes after the Dodgers took the lead in extras off an Adrian Gonzalez homer. The action got started early as the Giants struck first in the bottom of the first against Scott Kazmir. After Kazmir retired the first two batters on four pitches, he decided to give two free passes away. Most importantly, Posey threw his bat into the protective screening, which activated Giants devil magic. After that, the Giants proceeded to score two runs on back-to-back two-out singles to take an early 2-0 lead, which always seems insurmountable the way this offense has been running. …and the Dodgers immediately struck back in the top of the second. 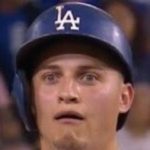 Trayce Thompson led-off the frame with a single up the middle, and he then tagged from first on a fly ball to left off the bat of Joc Pederson, beating the throw into second base and getting into scoring position with a nice piece of baserunning. Yasmani Grandal then cashed him in with a line drive single into center to cut the lead in half, 2-1. Everything was silent on both sides until the top of the fifth, when Justin Turner hit a two-out single up the middle and Adrian Gonzalez followed by (finally) hitting a ball in the air off the wall in right center to drive him in and tie the game at 2-2. Unfortunately, in the bottom of the sixth, Kazmir’s command finally pooped itself thoroughly enough that it was untenable, and Louis Coleman had to be brought in after Kazmir gave up a lead-off single and then walked the next batter. Kazmir went five-plus innings on 90 pitches, surrendering just three hits but walking five en route to giving up three runs. Coleman actually did his job magnificently, coming in and inducing two double-play ground balls. However, the Dodgers couldn’t turn either of them thanks to Chase Utley being old, and on the second failed attempt the Giants scored a run to go ahead 3-2. J.P. Howell then entered to face a lefty and walked the man he was supposed to get. He was then left in to face a righty for whatever reason, but thankfully the Dodgers weren’t punished for that mistake and he managed to get him. The Dodgers then immediately came back and threatened in the top of the seventh, with an Enrique Hernandez walk and a Utley single up the middle to put runners on the corners with nobody out. Corey Seager then hit back to the pitcher and Enrique was caught off third for the out for whatever idiotic reason and there was suddenly one out with runners on first and second. Where is the rush to go on that play? Obviously they would take the double play, so you don't need to break on contact. Turner then worked a full count and drilled a ball to right, but directly into the glove of the right fielder, which at least advanced the runner to third but he deserved more. Gonzalez followed by working a walk to load the bases, and Trayce came up with the big play of the inning by working a full-count walk to tie the game at 3-3. The Giants escaped further damage, but Bruce Bochy used five pitchers in the inning, which seems odd but is actually rather understandable given the leverage of the situation. Adam Liberatore entered in relief to face three left-handed batters and retired them in order without issue. Joe Blanton entered in the next frame and was huge for the Dodgers, as he got two clean innings to get the game into extra innings. In the tenth, the Dodgers offense finally got a run, with A-Gon drilling a 0-1 pitch to left field for a homer and a 4-3 lead. That brought in closer Jansen, who struggled yesterday before finally notching the save. After retiring the first batter on an infield pop-up, he gave up a double into the right-field corner to put a runner in scoring position and the lead in jeopardy again. This time the Giants cashed in with a single into left center and the game was tied at 4-4. After a fly ball single given up because Thompson got a horrible break on the ball, Jansen was in trouble again. Posey then walked it off with a single up the middle, because of course he did. The team is now 33-30 on the year overall and 16-16 on the road. The Dodgers play the Giants again tomorrow in the series finale at 2:30 PM HST/5:30 PM PST/8:30 PM EST. The pitching matchup will be Julio Urias against Jake Peavy, and while Peavy is not anywhere close to the Peavy of old anymore, Urias is a complete wild card at this point.